الخيار الأفضل للحصول على المتعة والاسترخاء, Pacific Bay Hotel يقع في منطقة طمون باي في جوام. يحظى هذا الفندق ذو 3 نجمات بمكان ممتاز يسمح بالوصول إلى المعالم السياحية الأكبر في المدينة، فهو يبعد مسافة 1. Km عن صخب المدينة. يوفر الفندق بفضل موقعة الجيد وصولاً سهلاً إلى أهم معالم المدينة.
. استمتع بالخدمات الراقية والضيافة التي لا مثيل لها بهذا الفندق في جوام. إن مكتب الاستقبال على مدار الساعة, تخزين الأمتعة, واي فاي في المناطق العامة, صف السيارات, غرفة عائلية هي جزء فقط من الخدمات التي تميز Pacific Bay Hotel عن باقي الفنادق في المدينة. لقد جهزت هذه الإقامة الفندقية بعناية فائقة لتوفر مستوى عالي من الراحة. في بعض الغرف يجد النزيل مناشف, تلفزيون بشاشة مسطحة, غرف لغير المدخنين, مكيف هواء, مكتب. يقدم الفندق مجموعة واسعة من وسائل الراحة المتنوعة، كمثل: حمام سباحة خارجي, سبا, تدليك, حديقة, كاريوكي. اكتشف مزيجاً ساحراً من الخدمة الاحترافية والخيارات الواسعة من وسائل الراحة والمتعة في Pacific Bay Hotel. the room and size of room was alright even if some amenities were not included. some disappointments were: wifi-wifi was paid for which i didnt mind but what was disappointing was the connection gets cut off in the middle of the night. reason given was that they were full. so if you are charging all your guests for wifi why dont you upgrade the speed of what you offer? hot water-no hot water. i was told somebody closed the valve. or i should run it for 5-10minutes. till they finally fixed it on my last day but still i should run the water for 10-15mins before using. really? I arrived late - just an overnight layover. When I opened the door, there was water on the floor, apparently a leak from an AC on the ceiling. I was extremely tired after a long flight but I had to wait for someone to clean it up. The hotel is old, so there were some holes and stains. You can hear quite a lot from the next rooms, especially water-related. Wifi is available only in the lobby area. It was only a 10-hour-stay so it did the job. Guam is just a small island, you don't need lots of facilities and 5 star hotel while on tours. if you just need a place to sleep and leave your things go for this hotel. they don't serve breakfast but that is ok, there are some nearby to-go fastfood chains and family mart just outside the street. restaurants are just across the street and outside the building, so nothing to worry. We have a connecting room that has 4 beds and a bathroom. spacious in a way for a group of 4. This place is in a great location within walking distance to the main downtown area. You can rent a car, but parking can be tedious if the lot is full. You need to park on the street or in another lot which is not stated anywhere. The room is clean and the staff does an amazing job.. but this place needs some upgrades. You can see the painted walls with touch ups and the bathrooms with touch ups.. you can see the doors chipped or many other issues that show that this place needs to be refurbished. The elevator was not working, but the other one was even though it did not cause issues to get to the room. The card key was malfunctioning, but if you blew on it it would work again. Hotel is dated, 20+ years, old decor, definitely could be updated. Expect only basic amenities. Beds could be more comfortable, mattresses seem to be on the low end. Basic cable provided on in room tv, some rooms had flat screens, some had 13" tube tvs. Location is nice and near the beach, bars and shopping. 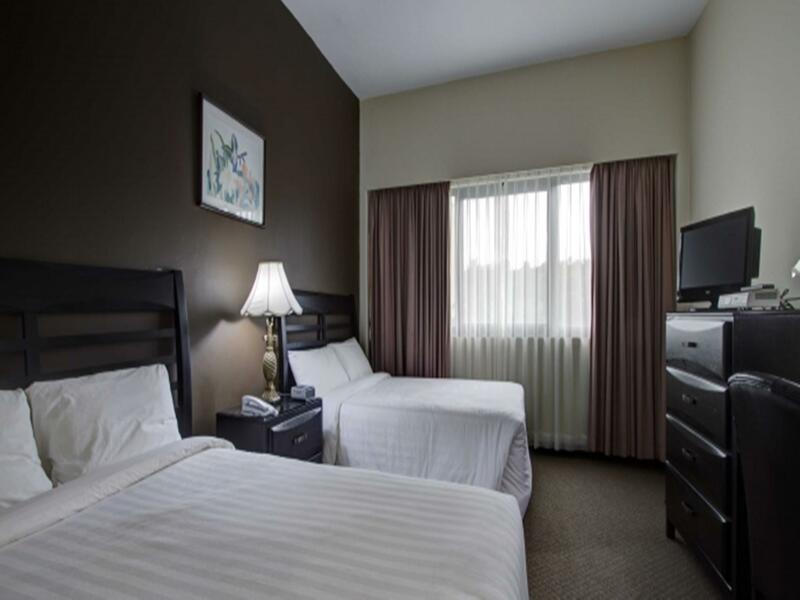 Walking distance to many great attractions and restaurants. exterior does need to be updated, building looking old and gloomy but rooms are comfy. Old, but good location. You can try this one if you want to save money and enjoy the tumor bay. Clean Room. Hotel is accessible. Nice and polite staff. Toilet ran all night, old and run down hotel. Too much for a nights stay but everything is expensive in Guam. Not far from airport, metre taxi just Us$22/single ride. Free wifi in lobby, but us$5 in room wifi for hold stayed. we were having a very bad experience staying here. First, found myself woke up in the middle of the night because of noisy sound in the room, when I turned on lights, I saw 2 flying cockroaches in our room. killed them with sandals, put aside next to the bin. Next day, although we put the sign"clean up the room" on our door, the cockroaches bodies were still there!. Second, the room itself is not properly cleaned, you'll know the differences when you spent nights in so many different hotels. Then, on the last day of our stay, realize that lost one of my goods. Asked the receptionists, cleaning lady, nobody knows. Last one, They double charged my card, fortunately after days of back and forth email with both hotel staff & my bank, all things were settled. Frankly speaking, you get what you pay for. It is very clean, staff is extremely helpful, location is perfect, 5mins away from the beach and lots of restaurants around. In overall it was pleasant stay. P.S. I want to personally thank receptionist called Edrea, who check us in and out! If you really are in a tight budget then go for this. Guam is relatively an expensive destination. 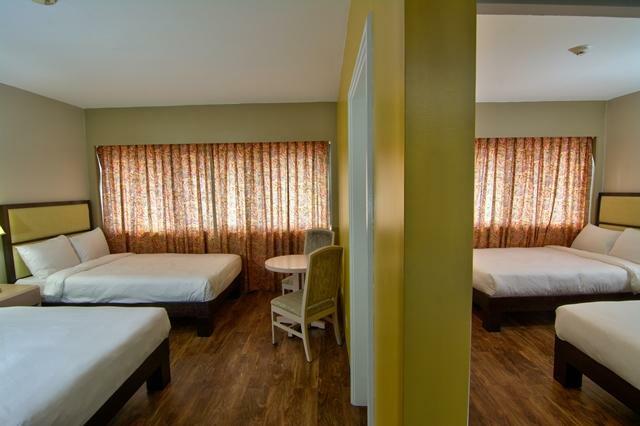 If your purpose is to have a nice time in the beach, then dont stay here but if your are just looking for someplace to sleep with a private bathroom then, this will be perfect for you. Staff mostly filipinos. Just bring your own towel, the towel provided was old therefore too thin. No coffee and tea making facilities in the room. You can just ask hot hotel in the reception. 5$ In room wifi is charge for the whole duration of stay however we did not avail because wifi cant reach the location of our room. I think the beds n pillows are new, they did not remove the plastic, it sounds whenever you move, its quite irritating. The bed covers n sheets are likewise new. The location is good. Lamlam Bus stops in front of hotel. Good to stay if you're on budget and don't really care about the cleanliness and amenities at the hotel. Location (bus stop, ABC store and restaurants nearby) is great and walkable to 'down town'. and beach. As I traveled on my own, so safety and location is my priority and I really don't care much about the rest. The hotel seems old. Facilities like television is old and it's not even plasma or smart TV. Its just so unfortunate that the hotel has a good location but it was not well maintained. They need to renovate the place the uplift its facade, interior, and exterior. It has a spacious location. 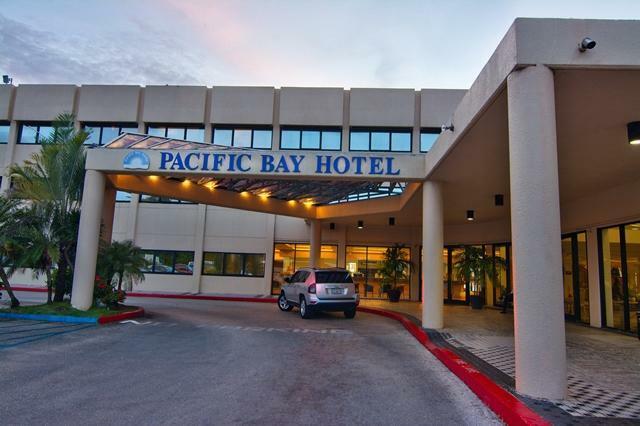 Very accomodating staff, early check-in provided to us, restaurants in the hotel, a short walk to Tumon Sands, DFS, The Plaza, JP Superstore, dining places, beaches, etc. Very near an ABC store. Red Guahan shuttle bus stop just in front of the hotel along San Vitores Road for unlimited rides to/from the Guam Premier/Micronesia Mall or just simply hop on/hop off with the use day passes. I couldn't stand for the sound of the plastic sheet(?) under the regular sheet. Whenever I moved, the sheet made so much sound. Couldn't have a good sleep. Also, the faucet in the bath tab fell off while I was taking a shower, so I was able to have only one minute shower. Although a guy came up to fix the faucet right away, it took some time to repair and the bath room became so dirty after he repaired. I needed to clean up the bath tab and bathroom floor. Definitely no recommendation for a family.